Keep going. The beginning is always the hardest. Phoenix rising from ashes. And so do you. How many times have you heard that saying already? Countless times. It’s true. No argument about that. But how many times you just shrugged your shoulders and said “I can’t do it no more” when you felt like the world’s only job is to fight against you? You desperately want to achieve your dreams, but it also means a lot of sacrifices, a lot of sufferings and a lot of stress. And you are willing to take actions. But sometimes, even the smallest thing can be such a burden, especially when you are in doubt, when you don’t know what to do, when you are not sure if you have what it takes to succeed. I know how you feel. Because I did, and I still feel that way from time to time. Life is already hard even if all you want to do is to get through the day. It becomes brutal when you need to achieve something big in your life. Too many obstacles and naysayers that stand between you and your dreams. It is easy to give advice to people, telling them to overcome obstacles and ignore naysayers. Of course, it is easier said than done. Have you ever had the feeling that you are not doing the right thing toward your goals? Because I know I have. Many times. It’s when after sending so many emails and received nothing in return, or when my writings and my websites did not appear anywhere whatsoever, or when I saw all of these incredibly talented people were competing with me – a total beginner. It felt like shooting for the star with an arrow in an unknown world. Who am I to have a chance to win? People said we needed to be patient, to see results in the end. But what if there is no result after all? Many people tried and failed. What makes me different to be one of the guys who will succeed? Voices in my head told me to give up. People around me were evidence of failure. It just felt so right to quit sometimes. I thought I was strong and determined. But sometimes I wasn’t. It turned out my willpower was not that strong after all. It wasn’t enough to help me keep pushing forward. And unfortunately, self-loathing and beating myself up weren’t helping either. But there are few things I’ve done that help me to keep going forward. “You can’t move forward unless you know what your destination is”. I imagined who I wanted to become. I clearly visualized how I would work, where I would work and how my life would be. I created my vision board, put all the things I wanted to achieve on my vision board and I looked at it every single day. Every time I felt down or unmotivated, I looked at my vision board again and imagined how great it would be after all my dreams come true. My goals were my rewards at the end of the stairs. All I needed to do is to walk on the stair, one by one. I broke down my goals into different steps and activities that I needed to do to achieve them. After doing those activities, I reminded myself that I was walking one step closer to my goals. There are countless naysayers in the world. And it does feel like I am a naysayers magnet. No matter what I do, they always have a way to tell me off, to convince me that I will fail in the end. The more time I spent with them, the less likely that I would make it, and the more loser I became. So I separated myself from them. Even though that meant saying goodbye to some of my close friends, or even some family members. I find people who are like me. I surround myself with them. Sometimes they are the people who I haven’t or will never meet. But it doesn’t matter. It does feel lonely sometimes. But if winners are not lonely, then every people are winners already. Even in my toughest time, I could always find people who struggled more than me. People who suffered from sickness, losses and so much more than I could ever imagine. But they made it. All the way to the end. If they could, why couldn’t I? It might sound unrealistic, but no matter how slow I walked, forward is forward. And I am a better version of myself than yesterday. I am closer to my goals than I ever was yesterday. And I kept track of all my tiny successes to remind me that. I never thought I could have my articles published. But they were. I never thought I could write something that people wanted to talk about and share. But I did. I never thought I could have some connection with some talented writers. But I did. People keep talking about following your dreams, doing the right things and success will come along. But those successful people didn’t tell us about the first painful phase after you decide to follow your heart. It is painful, it is hard and it is frustrating. Sometimes we will feel lost and lonely. Sometimes we will doubt ourselves. We will want to quit many times. But let’s stick with it together. Every great thing starts with humble steps. I know I am walking toward my goals because no matter how hard and painful it is, it comes from my heart. And I will never go wrong if I just follow my heart. 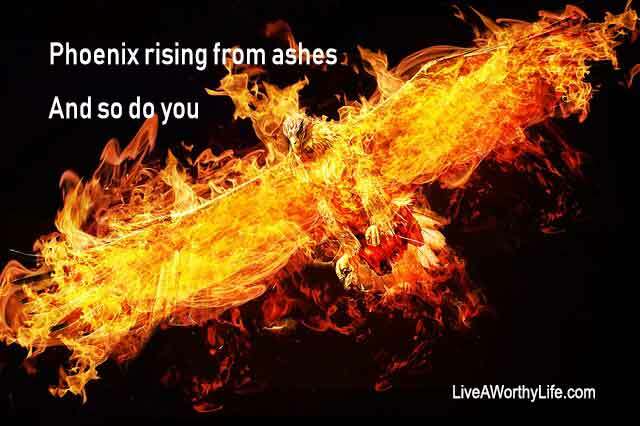 Phoenix rising from ashes. And so do we. I believe we can create our own happiness. I help overwhelmed and frustrated people to ditch their stress and enjoy their lives again. Grab your free actionable cheatsheet: 5 Simple Tips to Release Stress and Bring You Calm in Under 5 Minutes and join her free 7 Joyful Days Challenge email course.